Jl. Raya Sanggingan 9, Ubud, Bali. Indonesia has a long history of the sculptural arts ranging from megalithic images, 8-10thcentury sculptures and reliefs of foreign Hindu-Buddhist origins and indigenous tribal artifacts created as ancestor, deity and animal memorial sculptures. Up until the 1960’s Indonesian sculpture was mostly figurative. However, in the mid 1960’s Javanese sculptor Sidharta, made enormous impact with his abstract sculptures that were a radical departure from recognizable forms. Sidharta played an instrumental role in creating a new understanding and awareness of sculpture and then it began to receive respect, and eventually demand for such collectable objects of fine art grew. The AsosiasiPematung Indonesia (Indonesian Association of Sculptors), API was founded by Sidharta in Yogyakarta in 2001. API is an open organization dedicated to raising the profile of sculpture in Indonesia and now has more than 120 members. ‘Cosmic Energy’ is the celebration of contemporary sculpture by API Bali along with guest artists from Java its first group exhibition in Bali. Ninus Anusapati, Hedi Hariyanto, Komroden Haro, Syahrizal Koto and Lenny Ratnasari Weichert. According to the Hindu philosophy the word Shakti translates as Cosmic Energy – the unseen energy that contains spirit and life. It is the universal creative life force, as well as the artist of API’s invisible muse. 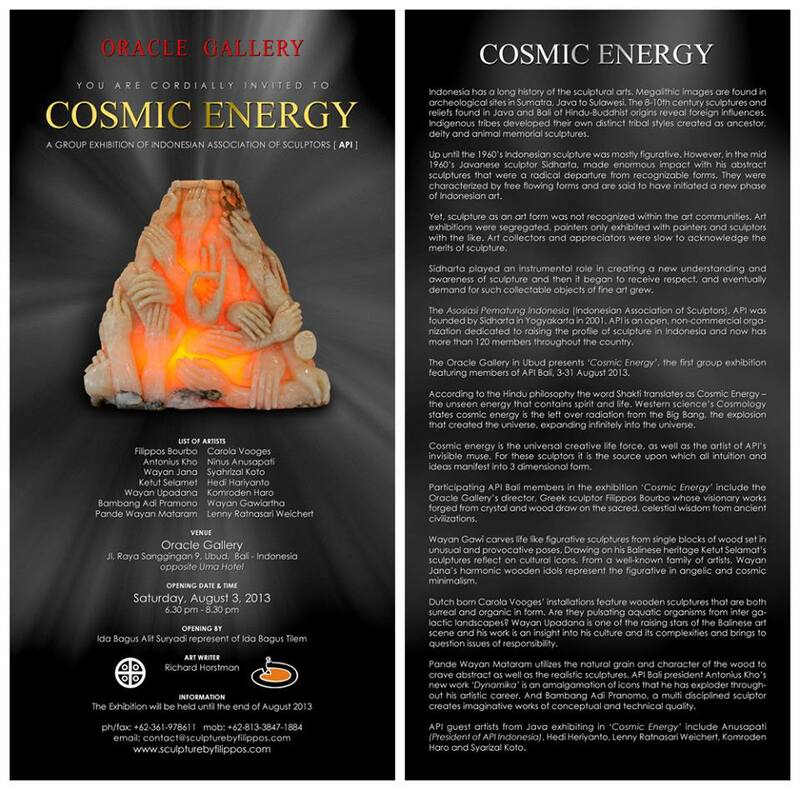 For these sculptors ‘Cosmic Energy’ is the source upon which all intuition and ideas manifest into 3 dimensional form.